Hello! My name is Zach Nelson and I am a Colorado boy with a big Nebraska heart! What this means is that even though I'm from Colorado, I consider Nebraska to be my second home. I graduated from Chatfield High School in Littleton, CO and moved to Nebraska to study secondary education at the University of Nebraska-Lincoln. 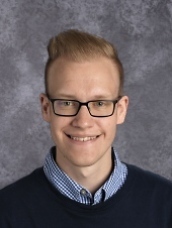 Being a recent graduate, I am headed into my first year of teaching at North Star High School. I could not be more excited! I love education, what LPS represents as a district, and am ready to dive right in!